Estuaries are wetlands in which freshwater streams and rivers meet the sea. Because of the mixing of freshwater and ocean waters, the salinity in an estuary is less than that of the open ocean, but greater than that of a typical river. Thus, organisms living in or near estuaries have special adaptations, for example, invertebrates such as clams, shrimps, and crabs, as well as fish such as striped bass, mullet, and menhaden. Unfortunately, estuaries are also popular locations for human developments and businesses. Contamination from shipping, household pollutants, and power plants (that is easily carried to the sea via the estuary) continually threaten the ecological health of many estuaries. 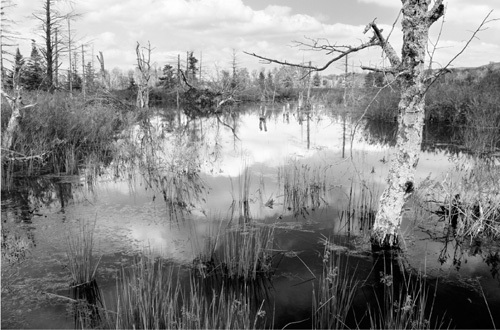 Wetlands, including bogs, swamps, marshes, and estuaries, are important for preventing flooding, purifying water, reducing erosion, and providing food and habitat for plants and wildlife.